Airy and light, this sweet ending is perfect for a spring celebration of any kind – a luncheon, dinner, or springtime tea. 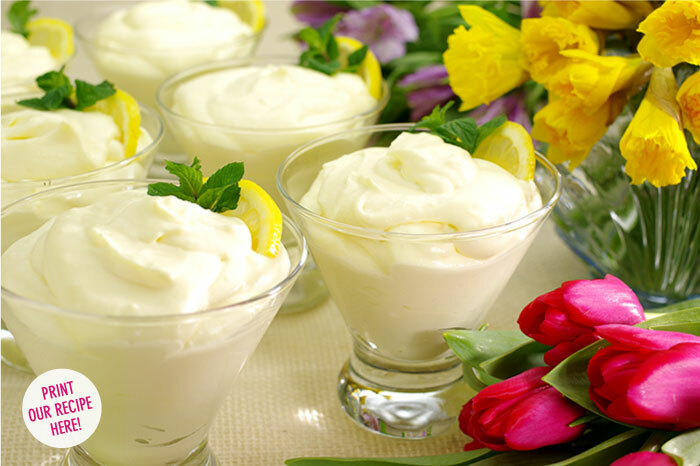 Starting with a lemon curd-like base, whipped cream cheese and cream lighten the texture while enriching the taste. Each spoonful is a blast of tangy and sweet, a harbinger of summer lemonade. Showcase your small sherbets or stemless goblets when serving this delicious dessert. 1. 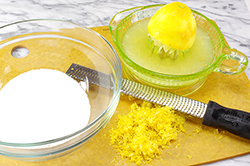 In a small bowl, mix the sugar, lemon juice, zest, and salt together. Set aside. 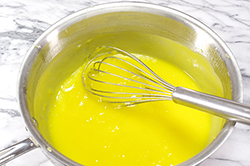 In a separate bowl, whisk the egg yolks and eggs together. Set aside. 2. In a medium saucepan, melt the butter. 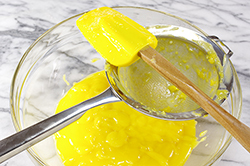 Add the sugar-lemon mixture and heat over a low burner until the sugar is dissolved and just begins to simmer. 3. 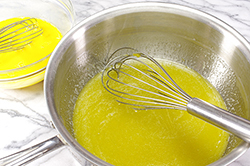 Add a 1/4 cup of the warm lemon-sugar mixture to the beaten eggs whisking well to quickly distribute the heat, (a process known as tempering). Continue adding 1/4 cup increments until all is incorporated into the eggs. 4. Transfer the mixture back to the saucepan and heat over medium-low heat whisking continuously until the sauce is thickened and coats the back of a spoon. The mixture is thoroughly cooked when it reaches 160°F. 6. In a deep bowl, beat the heavy cream, powdered sugar, and vanilla until stiff peaks form. 7. 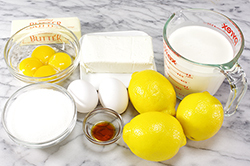 Place the cream cheese and 1/2 cup of the cooled lemon sauce in a large bowl and beat with a hand mixer until combined and smooth. (If the cream cheese is room temperature this will be easier). Add the remaining lemon sauce. 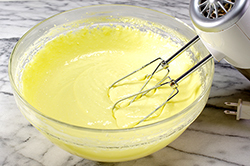 Add one quarter of the whipped cream and whisk until combined and lightened in texture. Repeat by adding another quarter of the whipped cream. 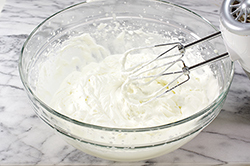 Add the remaining whipped cream by hand using a gentle folding motion to combine the two without deflating the mixture. 8. Spoon the mousse into serving glasses and refrigerate until serving time. Garnish with a sprig of mint and a quarter of a lemon slice wheel.